Some of the most relaxing moments of the road trip took place during my stay at Hotel Kabuki, a Joie de Vivre Hotel. Situated in the heart of SF's Japantown, the comfort meets culture urban oasis was the perfect reprieve after long days of meetings and driving. 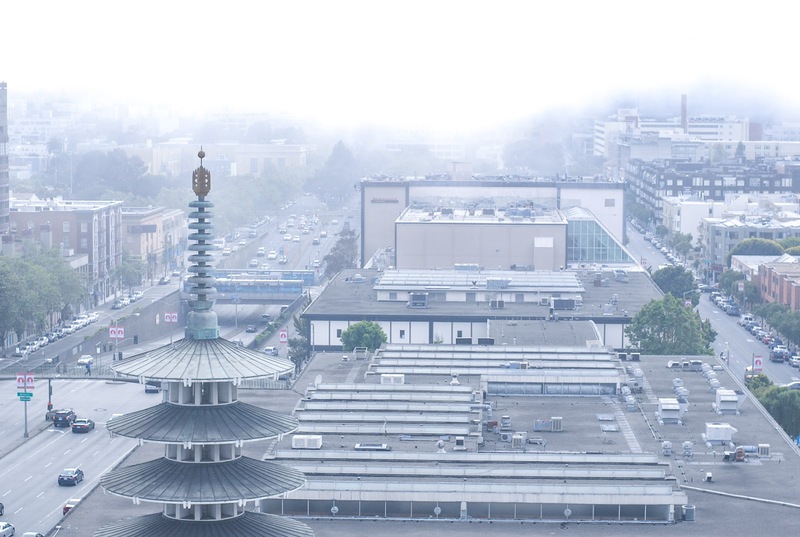 Every morning, I slid open the traditional shoji screens and awoke to the foggy yet breathtaking view of SF while sipping on steamy hot green tea. And every evening, I soaked in the traditional three foot deep Japanese tub while reflecting on my journey with the white noise of the Frisco wind tumbling in the background. One hop outside the hotel and I'm lost in the fragrant scent of Japanese restaurants, head spinning by the endless options and stomach churning with greed. The hotel's picturesque Japanese garden complete with its own koi pond was the picture of serenity and where I found myself spending brief yet treasured moments of contemplation. Until then, my mind had been consumed with planning and executing the trip that I hadn't had a chance to savor each gratifying moment. Sometimes, the meeting of heart and determination can produce joyous results. I love that hotel! It is one of my favorites. It really is like an oasis in a busy city. I'm obsessed with your little blog. I absolutely adore your style. Thanks for sharing!